Recovering various metals, involving minor rare metals, from electronic devices is important for conserving resources and establishing a sustainable society. 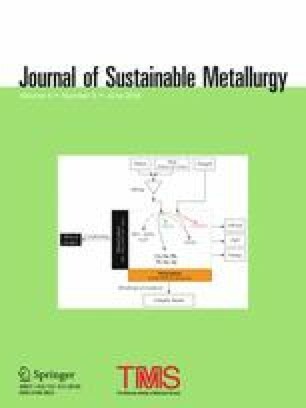 This paper describes an economically feasible and radical process for such recovery, especially, for Ta concentration from printed circuit boards (PCBs) which is the two-stage electric pulse disintegration (ED) process. Ta capacitors are detached from the PCBs in the first stage, and the sintered Ta contained within the capacitors is liberated from the capacitor in the second stage. It has been indicated that as much as 100% of Ta capacitors was detached from PCBs in nondestructive form in the first stage of ED and that 95% of sintered Ta and MnO2 phases was liberated from covered plastics, which is much higher than the 46% detachment achieved when using mechanical roll crusher. The detailed detachment and liberation mechanisms of both stages were also described, and an upper limit of the solution’s conductivity in the second-stage ED was indicated. This research was financially supported in part under the research project, “High Efficiency Rare Element Extraction Technology Area” organized by the Tohoku University and the Ministry of Education, Culture, Sports, Science and Technology (MEXT). The authors hereby sincerely express their deep gratitude to both the institutions.